With the Erasmus Bridge in place and Zalmhaven filled in, work began on consolidating this area. 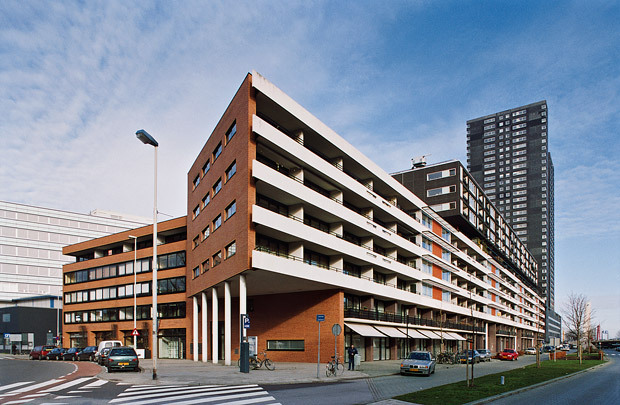 The 150 metre long building by DKV attaches to the 19th-century Nieuwe Werk quarter, mediating between it and the big blocks of offices and housing in the city centre. Crowning its six-storey main mass is a discrete black volume that seems to hover above the set-back 'base' of maisonettes whose oblique corner on stilts acquiesces to the building line of the street below. Brick, timber and concrete panels are among the cladding materials used.